Improvisation starts from everyday movements: walking, sitting, standing, crawling, lying down, in all sorts of different ways. 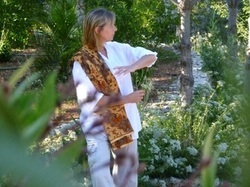 In this workshop you are guided to become more aware of the structure of your body as it moves through space. For most of us, our daily movement is something we never notice. Yet our bodies and our movement store memories and habits that affect and condition our whole lives. This workshop gives you a chance to pay attention to the way you move and to identify ways you might move differently. The way we have learnt to move shapes our attitudes; changing the way we move changes our attitudes. Our attitudes shape the way we move; changing our attitudes changes the way we move. Your body structure – specifically the muscular-skeletal system - including the movement of your spine and movement through the joints. Gradually you become aware of which parts of the body feel familiar and which areas feel unknown. Dynamics of pushing, pulling and releasing (letting go). Punctuation and sequencing in movement – noticing and moving in time with the flow of physical sensations. How you use the environmental space– do you prefer to move through the room or stay in one spot? Movement reading – a perceptual practice. How you can be aware of your own movement and the movement around you in equal measure? This practice cultivates an attitude of curiosity, generosity, and fun. The workshop is open to all, takes place indoors and needs no previous movement experience. This is the first in the cycle of five Move into Life workshops. It’s the best introduction to see if you want to go on to try one of the other workshops. Cost: £120 (excluding accommodation - see map below for local B&Bs and campsites.) Save £10 if you book and send your deposit before 6th September 2014.
please visit the Bookings page.